So, I’m trying to kick my coffee creamer habit. I know, this is drastic. Very. But it just means I’m one step closer to going all-organic, all-natural, all-local… At least for the most part. I, obviously, eat out with no problem, and when I saw that an organic pork loin was $15.99 a POUND at Wegmans last night (should’ve bought the one from Arden Farms yesterday morning at the co-op…grrr), I almost passed out. Seriously, I had to double-check to make sure the price was right. Yup, it was… And I’m sorry, I’m willing to pay more for organic produce and milk, but be reasonable people! FIVE TIMES the price is insane! Anyway, back to creamer. 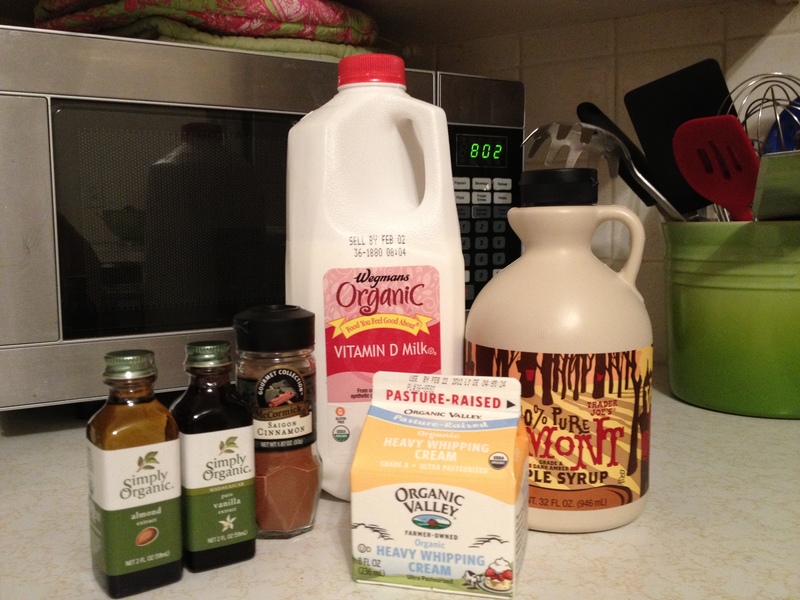 If you’re just joining me, you can read about my thoughts on coffee creamer here. Whole milk, heavy cream, maple syrup, cinnamon and vanilla and almond extracts. Simple enough. One of my main concerns with making my own creamer is that it won’t last as long in the fridge, since it isn’t chock-full of artificial stuff and preservatives, obviously. I ended up making the whole recipe (end product is about 2 C), and I’ll see how long it lasts. You heat the milk and cream just until it starts to steam, then add your flavorings. The recipe recommended straining out the spices, but I didn’t have anything fine enough (note to self: buy cheesecloth), so the cinnamon that didn’t settle to the bottom make it in. 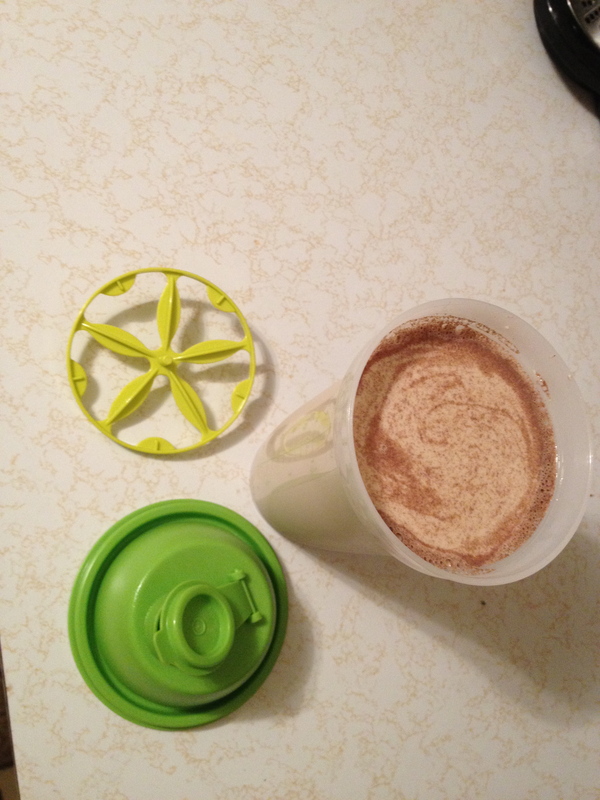 It has since settled to the bottom in the container (below) so it’s not a problem in the coffee. I have one of those handy-dandy Tupperware salad dressing shakers that I don’t use (I usually make so little at a time that I just whisk it together in a small bowl), and I thought it would be perfect for this, and it was. 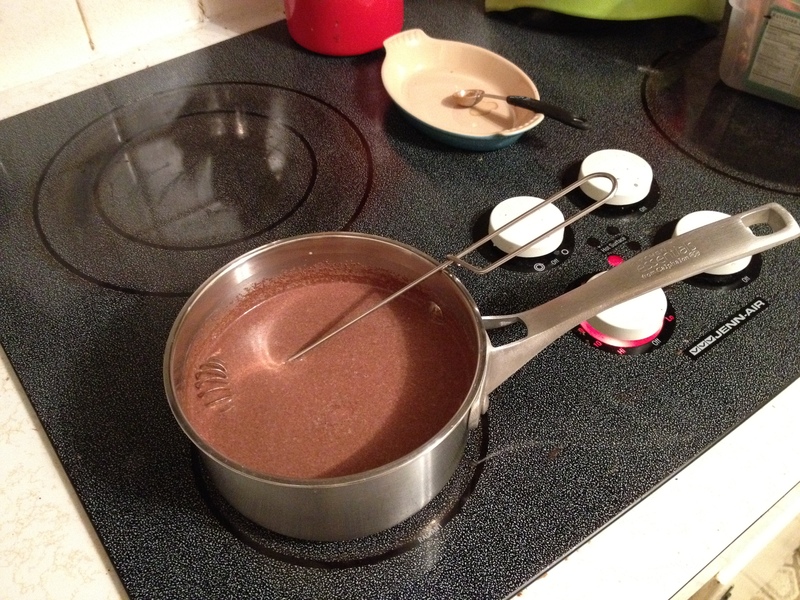 The 2 C fit perfectly and it seals well with a great pour spout–hurray! ….unfortunately, only so-so. It’s not as sweet, which isn’t that bad since it’s probably better for me to get used to a less-sweet cup of joe, but I still want SOME sweetness. In terms of texture, the creaminess of it was great. And there are definitely hints of cinnamon and the extracts, but overall, I don’t think it added much flavor. So, I think I’m going to try another recipe next time. Or adjust on my own. I’ve been adding about a teaspoon of sugar to my cups in addition to the 2 tbsp (72 calories = about the same as the bottled kind) of homemade creamer. Deliciously Organic has some additional recipes that seem to have a different ratio of cream to sweetener, so I might try one of those next (after calculating the calorie-count!) to see how I like it. However, making my own creamer has made me wonder, do I even NEED a flavored creamer? Wouldn’t sugar and milk or half-and-half do just fine? Maybe. But I do want to enjoy my coffee, and I really like tasting a distinct flavor. Which brings me to my next point: the flavor of coffee. One day, when our little Keurig bites the dust (it’s actually starting to make some funny noises), I’d like to get a really nice coffee maker and grind my own beans. I mean, if I’m going to have a cup every morning, I’d actually like to (one day) be able to really TASTE the coffee itself, and have an appreciation for a certain type of bean or roast. I mean, if I’m going to grind my own beans and make it in a french press or something like that, I don’t want to dumb-down that hard-earned flavor with bottled crap! So, perhaps I’m just starting out on this journey to transition from Kuerig coffee with creamer to good coffee in a coffee maker. For now, I think I’m still interested in experimenting with homemade recipes–one that will give just enough sweetness and actual flavor, without breaking the caloric bank or pumping me full of artificial ingredients. Posted on February 5, 2012 February 27, 2016 by thehealthypineapplePosted in #fabfood, Breakfast & BreadsTagged coffee, creamer.